When you put together a festival show it is important to think about such things as who are your audience and where you want to go with your career. Mostly we are looking for an audience like ourselves. People of your own age, your own income bracket, and education will have participated in the same cultural landmarks and experienced the same social events you have. If you are in your 50s and make a joke about Gilligan’s Island, your audience will get it. If you are in your twenties and you make a joke about Justin Bieber, same thing. You narrow your audience even further based on your aspirations. If you are touring pubs and clubs, that will be a different crowd to someone who tours community arts centres. If you are aiming for broadcast or multicast media, those are again unique niches. At the moment Kelfi & Fikel is pub and nightclub fare. 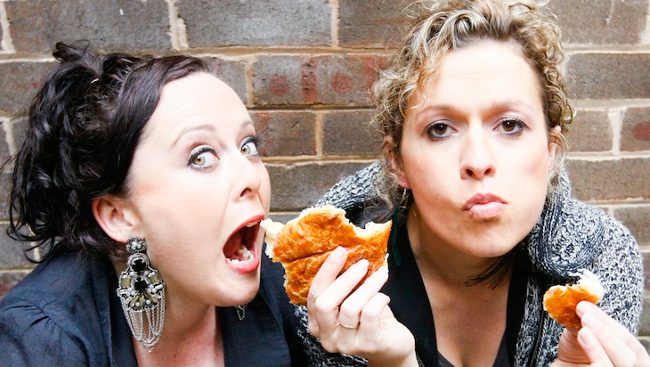 Fiona Della Ca and Kellie Higgins play around with transgressive humour. Most of their show, via music and sketch, punches holes through sexual taboos. However, that’s not all they do. We are also treated to a sprinkling of witty absurdism. Higgins and Della Ca clearly enjoy their material. This always gives a performance more vibrancy. There is no need to change it. I have to admit, I keep thinking, if they inverted the proportions of transgressive to witty, they could crack mainstream media. The women are both talented comic actors and musical performers. They have a hint of the Kransky Sisters about them. They would definitely do well in a modern D-Generation style sketch show. Television would require slightly tamer material, while retaining some of the bite. My favourite sketches of the evening had Della Ca playing a creepy home schooling teacher to Higgins’s child prodigy, Sammy. Each Sammy segment was delightfully inventive and hilariously peculiar. The “Can’t Song” was a surefire laugh-maker, showing off the well-trained voices and skilled musical composition of these women. If you enjoy naughty cabaret with a bit of sketch comedy, you will enjoy an evening with Kelfi & Fikel.